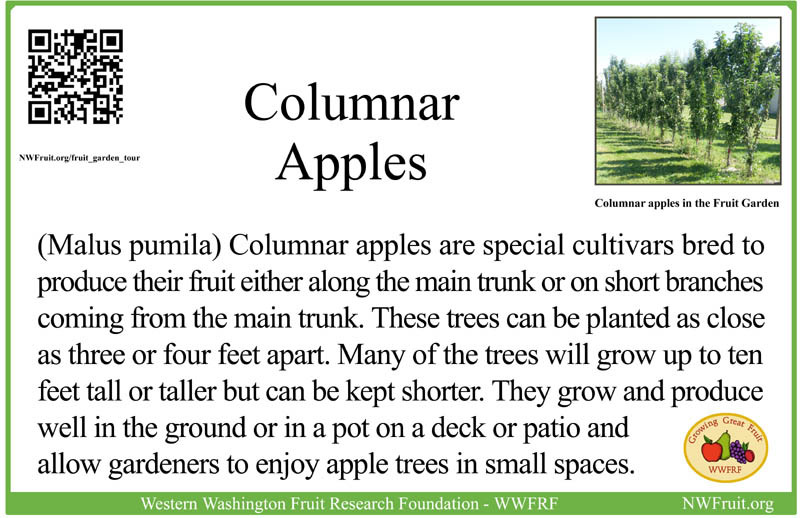 Columnar apples are most often grown on a dwarf or semi dwarf rootstock. As always with apples, plant two varieties for pollination. Dr. Susan Brown of Cornell University has allowed us to plant 5 of their unnamed test columnar varieties which are from stock which she has crossed with disease resistant apple varieties, and these trees have now fruited here in the Garden for several years. Dr. Brown plans to introduce an improved second generation of varieties. Our garden now also has “Urban Apples ®” which are also disease resistant columnar apples from the Czech Republic: Blushing Delight, Tangy Green, Tasty Red and Golden Treat.